Elderly care in South Korea has brought the attention from the world. The nation has shown the most extreme demographic shift in the last four decades with its population aging at the fastest pace among advanced economies. The proportion of elderly aged 65 or over accounted for 12.2 percent of the population in 2014, which is the 30th highest among the 34 embers of the OECD group. Besides the high proportion of elderly in the society, the pace at which the society is aging is also astonishing. From 1970 to 2013, the elderly population grew four times up, which is more than double the OECD average of 1.6 times, and is ranked first in the OECD group. The rapidly aging trend is further threatened by the extremely low fertility rate and increasing life expectancy. South Korea has one of the lowest fertility rate in the world—leading only Hong Kong, Taiwan, Macau and Singapore. In 2013, only 8.6 babies per 1,000 South Korean were born, the lowest level since the country began keeping record in 1970, in which the figure is 31.2. A study warned that South Korea could face natural extinction by 2750 if this rate continues. What’s more, the life expectancy is significantly higher now than one or two generations ago: 66 years in 1980 and now is 81 years, one year higher than the OECD average of80 years. Surprisingly, South Korea had the highest rate of impoverished elderly among the 34 developed countries in the OECD group. In 2011, the rate-the percentage of people aged 65 and over living with less than 50 percent of median equivalent household income-stood at 45.1 percent, contrasting drastically with the OECD average of 13.5 percent and is up from 42 percent six years ago. 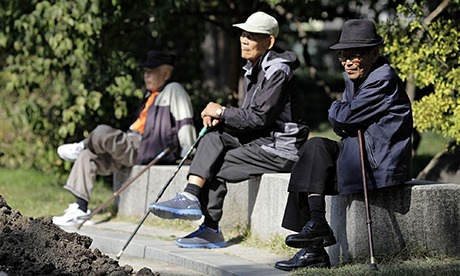 Developing elderly care in South Korea is made harder by the impoverished situation. However, government has been sluggish in improving the provision of elderly care in South Korea. While the government does provide a basic pension to retirees, it amounts to $200 a month, or just a quarter of the desired minimum amount needed for single household, according to the National Pension Research Institute Survey. And the limited pension is not even universal. Only about 35 percent of seniors receive one. These challenges of elderly care in South Korea are not, of course, unique. Problems alike are troubling Spain and Japan. But how the government and the society deal with the elderly care in South Korea is a test to their commitment in treating the most vulnerable citizens of the nation.